Summer tanagers usually don’t find our yard interesting enough to stay here, until this summer. It seems like weeks now that I’ve listened to their “pik-i-tuk-tuk-i-tuk” calls. Every time the calling would continue, I’d try to locate the bird, never with any luck until this evening. I stood and stood, hunted and hunted. First I spotted the male among the masses of leaves and branches. Please excuse the quality of the pictures. I know they’re far from being good. At least I finally found one and took it’s picture in the evening light. If you look close you can see yellow around its neck and down its breast a little. The yellow indicates it’s a young one that isn’t the total red of an adult male. The low evening sun made the female’s deep yellow front look slightly more orange. It was considerate for both birds to be in my final picture. The next morning the male called from the catalpa tree above where I was working. 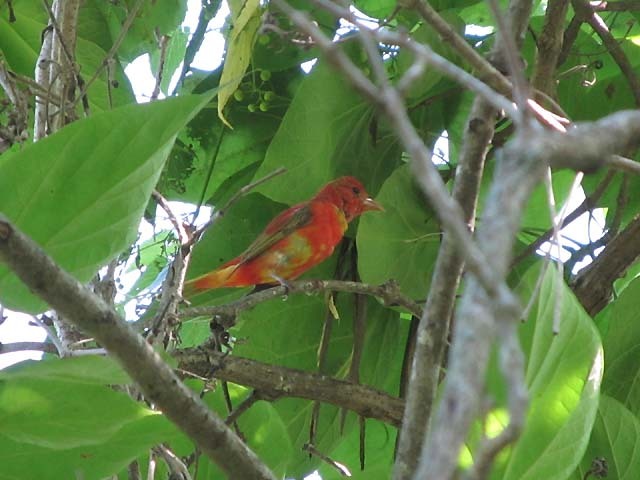 Adult scarlet tanagers are bright red with black wings. 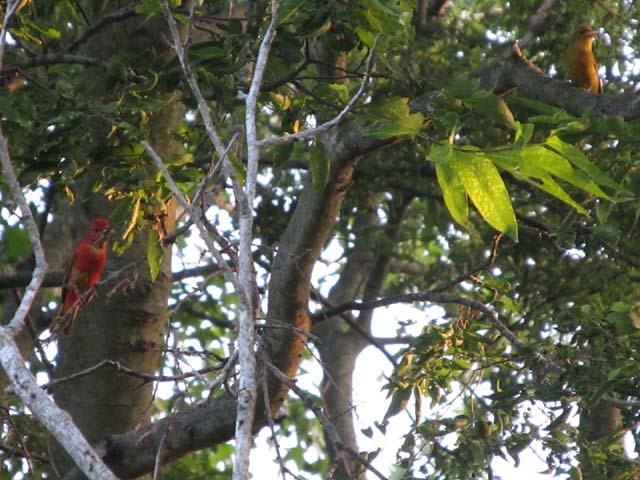 Call notes easily differentiate the summer from the scarlet tanager. 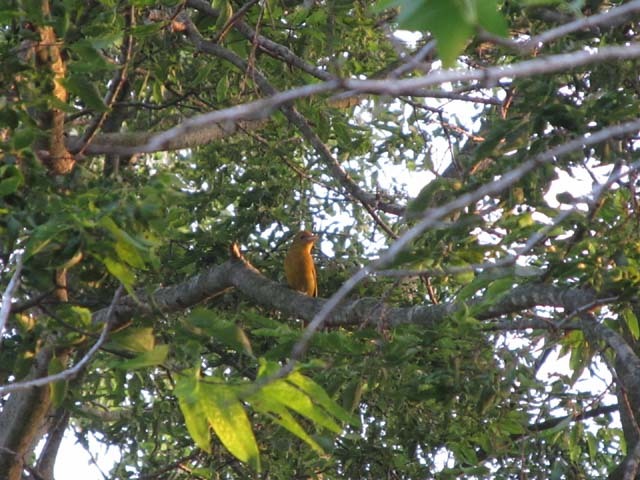 Summer tanagers give “pik-i-tuk-i-tuk” calls, and their song resembles a robin. 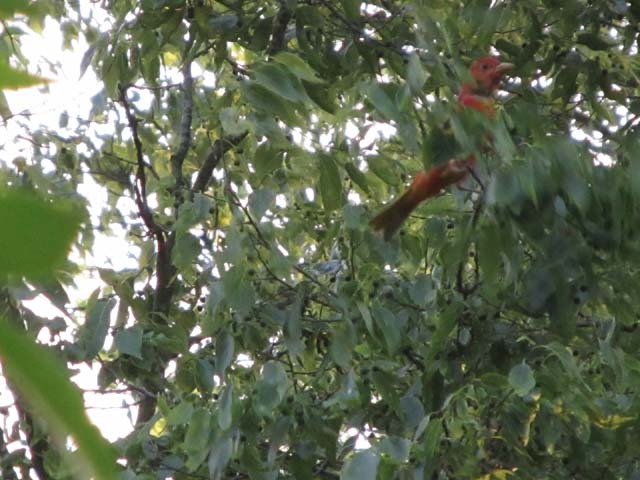 The scarlet tanagers repeat “chip-burr” calls, and their song sounds like a robin with a sore throat.